Review: [1997&On Cessna 172R (180hp)] I am a student pilot and wanted a POH that I could use at home to learn more about the plane I am flying. Excellent product and I used it extensively as a student pilot. Review: [1979 Cessna R172K Hawk XP] Brand new books. Full POH and safety supplement. Good price and worth the short wait. Review: [1998&On Cessna 172S] This is the perfect manual I needed to study my plane's specific data. I love that it is spiral bound. It is good quality and will definitely last for many years to come! 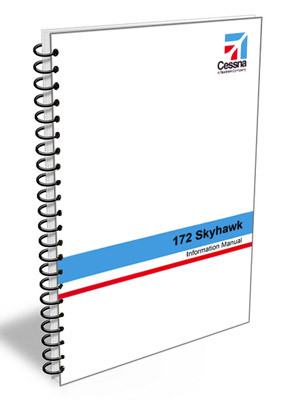 Review: [1974 Cessna 172M] I think it's cool you can get these manuals for the old planes. It's great quality and is exactly what I needed. Pros: Spiral bound. Inexpensive. High quality. Review: [1984 Cessna 172P] It's a brand new book (instead of the beat up one in the old plane). Great for learning the basics when you don't own the plane. Q: Hi, I have a question about your Cessna 172 Information Manual. Is this Information Manual the same as a Pilots Operating Handbook or Owners Manual? Or, in the alternative, does this manual provide more technical information? A: The Information Manual and the Pilots Operating Handbook are the same thing EXCEPT for the fact that a POH is specific to one specific serial numbered aircraft. It has all of the W&B and performance information for that specific aircraft. Whereas an Information Manual covers the basic model for that specific Year, Make and Model. They are both produced by Cessna but a POH can only be purchased from Cessna directly and is three to five times more expensive since it's for a specific plane.